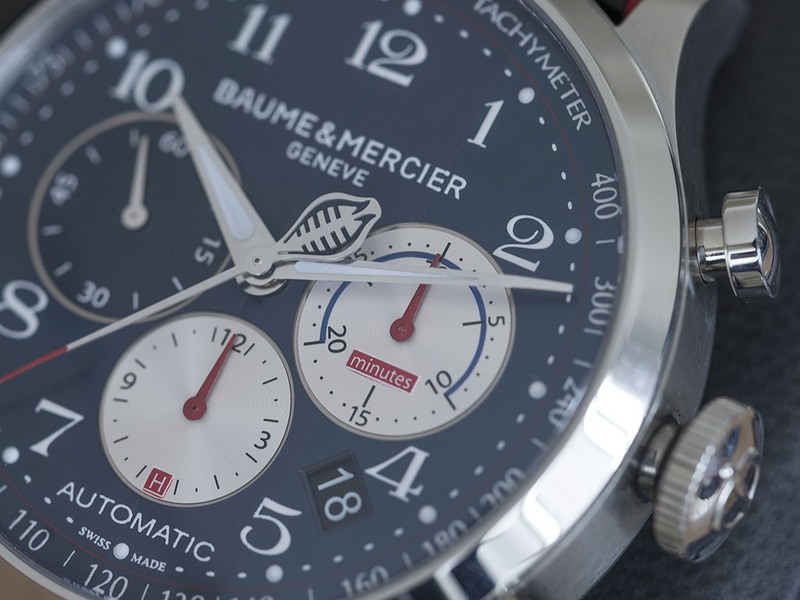 One of the oldest brands in the watch making history, Baume & Mercier often remembered with their classic designs withstanding the time's changing dynamics. 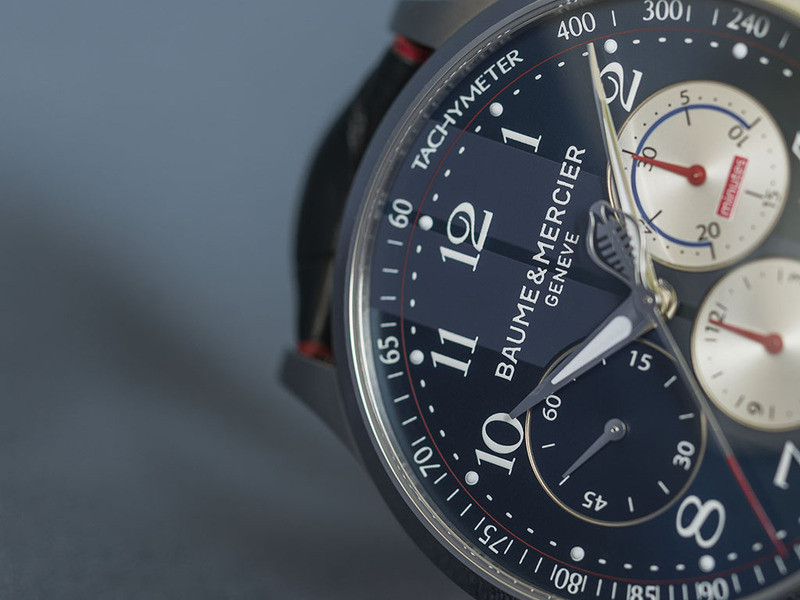 Having one of the leading positions in offering traditional designs through modern era, Baume & Mercier now joins the growing trend for oversized watches with highly demanded Limited / Special editions released via major frontiers of the watch making world. Before getting our hands on the watch let's have a short info about Mr.Shelby and his legacy. After searching the alternatives, Mr.Shelby decides to move the project with the British manufacturer AC's practically small and light roadster. Along with several upgrades on the car, Mr.Shelby takes out the original British engine and puts in a moderately sized 280cu.in Ford V8 engine. The car itself makes a sudden impact on the market with buyers varying from young males to experienced collectors. Having sold the first batch, Mr.Shelby witnesses the car being a cult figure and shifts the engine with the mighty 427cu.in Ford V8 ending up a true legend in sports car history “ The Shelby Cobra “. With it's ground shaking output of 450HP and less than 1000kg net weight, Shelby Cobra soon becomes the nightmare of the era's Ferraris by achieving top track records. 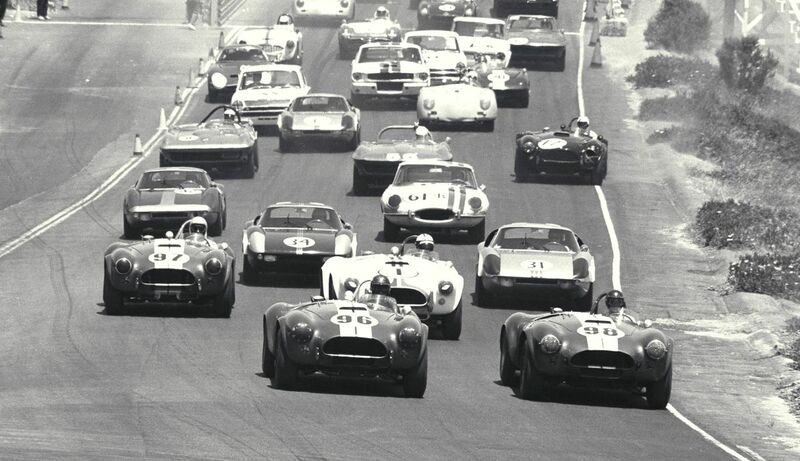 Arguably the most important but definitely the best remembered of all, Shelby Cobra wins the first place against Ferrari in 1965 FIA Championship. 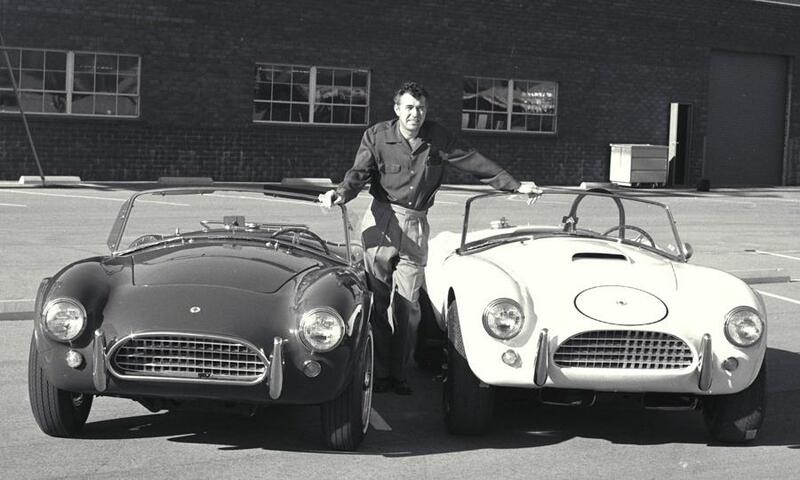 After a half century, Shelby Motors decides to commemorate the legendary race with a specially manufactured run of Shelby Cobra being limited to 50pcs only. Announcing the re-production of one of the most sought after classic of vintage sports car, Shelby shakes hand with Baume & Mercier for creating a watch as unique as the car itself. 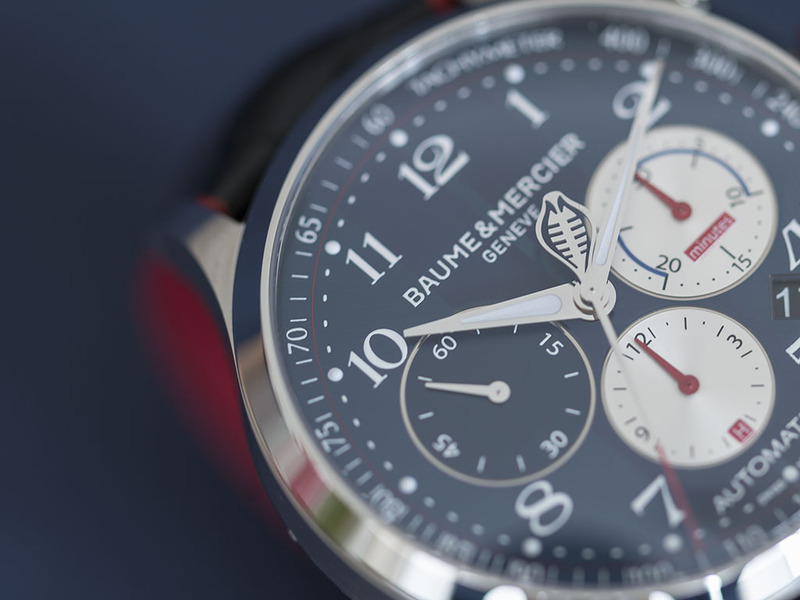 In order to the capture the sporting spirit of Shelby Cobra, Baume & Mercier successfully cased the project with their leading sports model Capeland Chronograph. 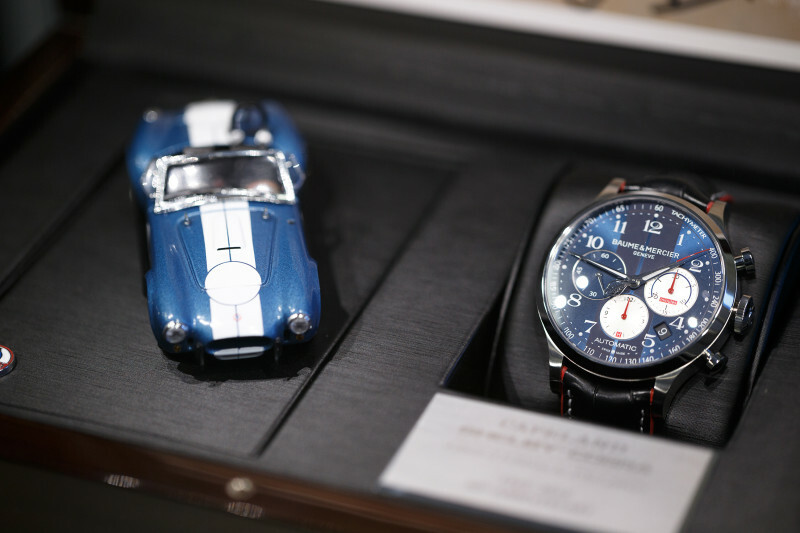 As expected from a Limited Edition watch, Baume & Mercier Capeland Shelby Cobra comes in a beautifully crafted wooden box accompanied with a diecast of the actual car. Surely a great gift for the boys with expensive toys. Sporting a La Joux Perret modified Valjoux 7750 automatic chronograph movement Baume & Mercier Capeland Shelby Cobra makes an impressive design figure. It's cleverly balanced 44mm diameter stainless steel case features an elegant combination of both brushed & polished surfaces. 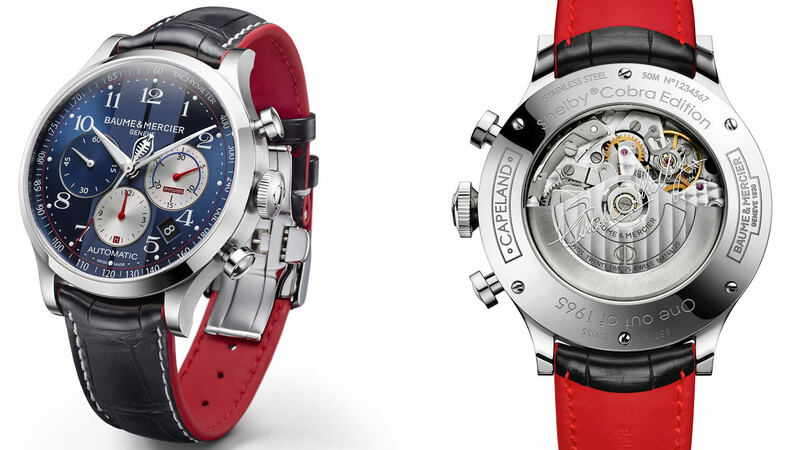 The watch has it's own exclusive resemblance with the car in brilliantly designed details. Though it looks quite hidden at the first glance, one with sharp eyes can not miss the vertical lines which are obviously similar with the ones on the hood of the Shelby Cobra. The form of the hands are inspired by the legendary three spoke racing type steering wheel. Placing a laser etched ( and superbly detailed ) logo at the lower end of the chrono second hand, Baume & Mercier strongly highlights the brand's keen attention on details. 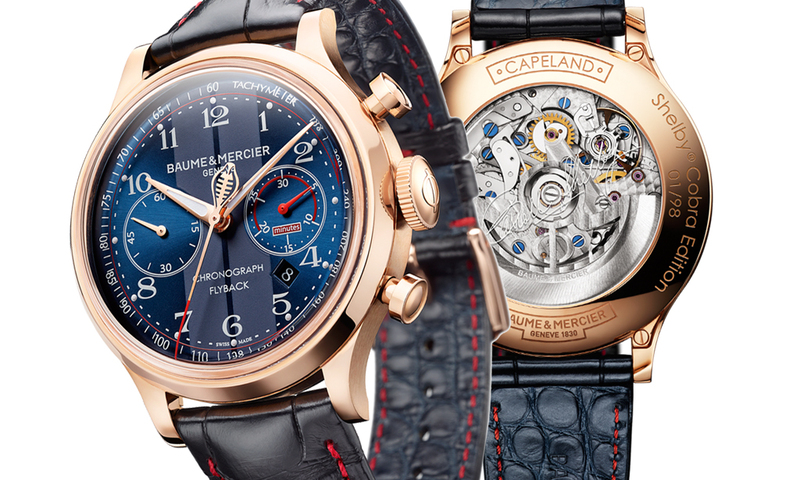 Exclusively created for the watch, the Arabic numeral index font matches the retro feeling of the dial perfectly. 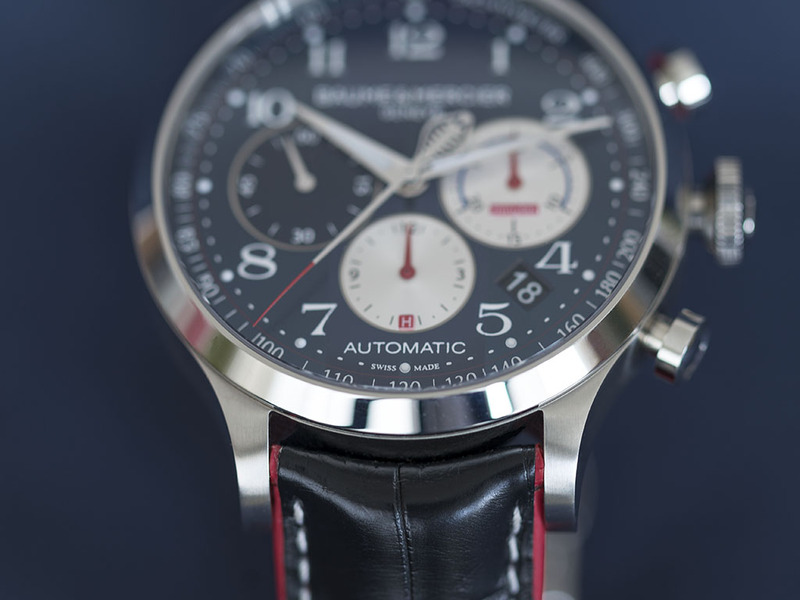 Inspiring on the actual dashboard & gauges, Baume & Mercier succesfully captured the design on the chrono sub dials. 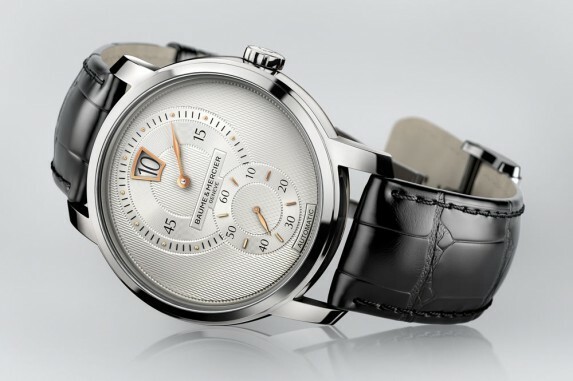 The transparent case back allows to view the exclusively customized caliber. 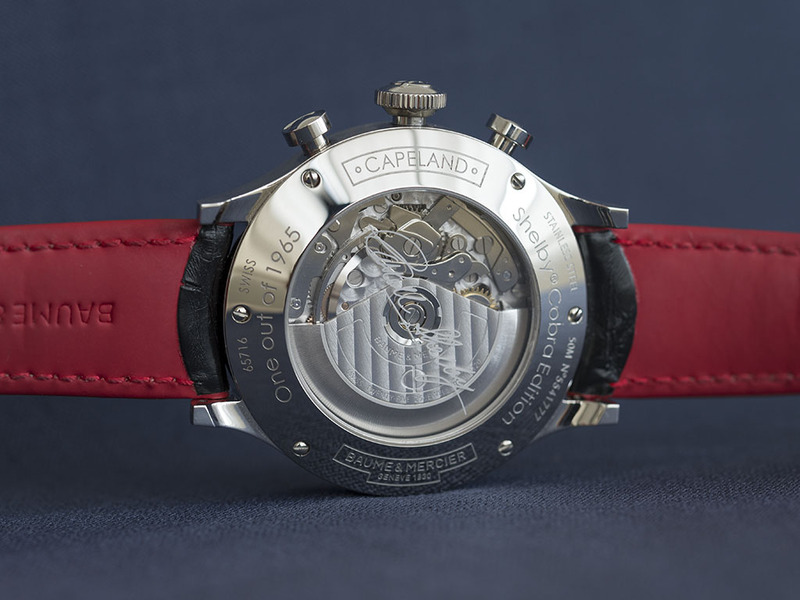 Case back also features the information about the watch's production number which is limited to 1965pcs only. Perfectly matching with the watch's retro concept, the crown and the chrono pushers have a slight height of the case allowing comfortable operation with better grip. 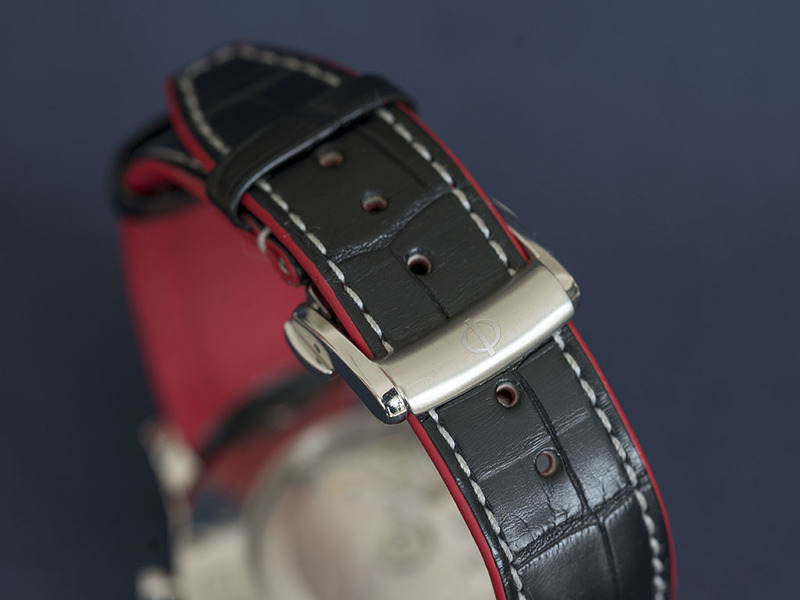 The watch comes on a thick but smooth alligator leather strap with contrasting white stitch which successfully matches the rest of the watch aesthetically. 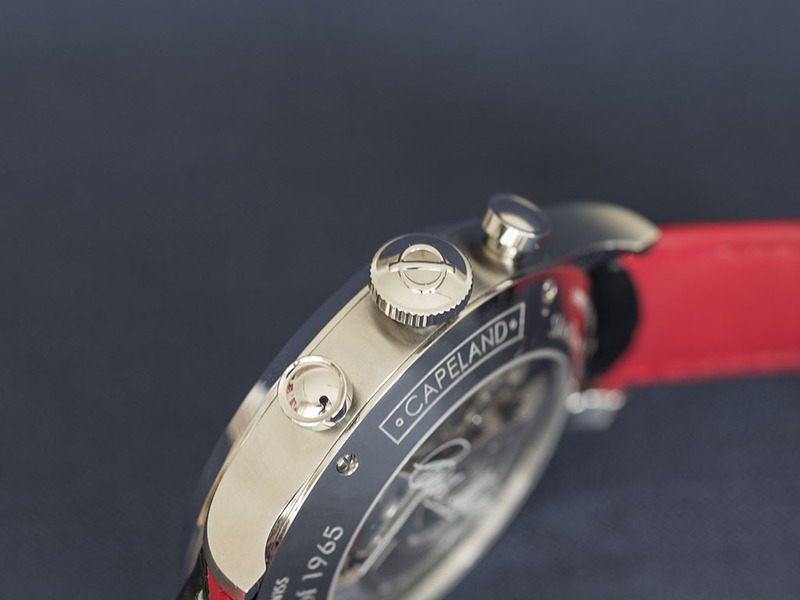 The folding clasp which offers a combination of both brushed and polished surface operates securely while keeping the watch's handsome and masculine appearance together. 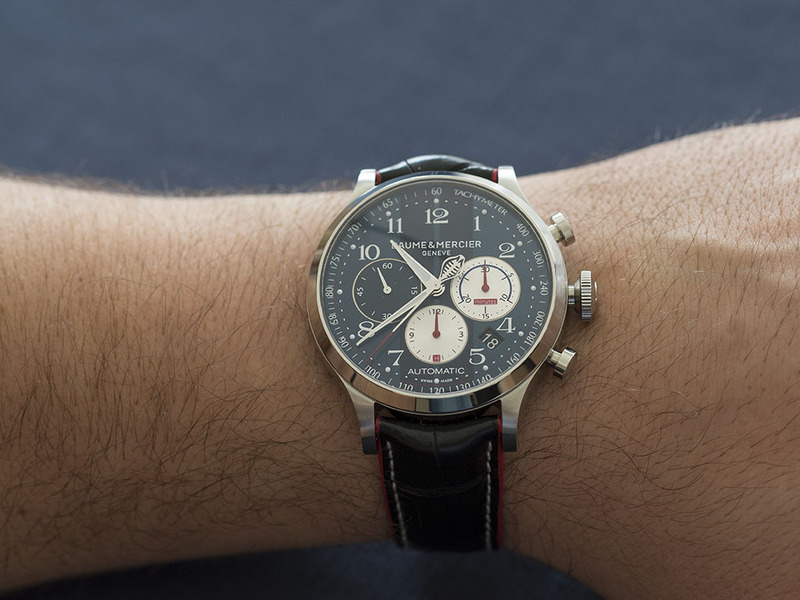 May be considered as a slightly oversized watch due to it's Valjoux 7750 based caliber, Baume & Mercier Shelby Cobra sits quite comfortably on the wrist presenting a bold figure. Accompanying the stainless steel watch with a solid gold version, Baume & Mercier cleverly prevents the difference to be limited to preciousness of gold by presenting the solid gold version with a Flyback chronograph caliber. We would like to express our sincere thanks to Richemont Group Turkey Marketing Manager Mrs. Sezen Kiracı for granting us the privilege of having such a beautiful timepiece and suggest everyone to pay a visit to a Baume & Mercier retailer who wants to have a special part of the Shelby Cobra legend on their wrist.